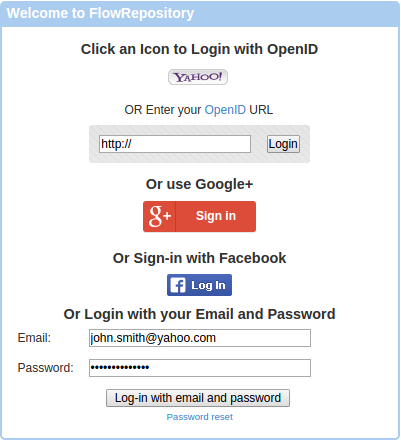 FlowRepository uses "Open ID" or "Google+" or "Facebook", or the combination of email and password to login. Open ID is a way for users to use a single digital identity across the internet. You can use this identity to login to different sites supporting it. About 90% of FlowRepository users use their Google account to login. However, as of April 2015, Google is no longer supporting OpenID. Currently, you can still use a Yahoo email account, or some other sites providing an Open ID as listed here. Say you had a Yahoo account, so in FlowRepository, you click on the Yahoo! login image, which will direct you to Yahoo, where you login into your account as you normally would, and then the Yahoo site redirects you back to FlowRepository. That way, FlowRepository never sees your OpenID password, but the Open ID provider will inform FlowRepository that you logged in and who you are. 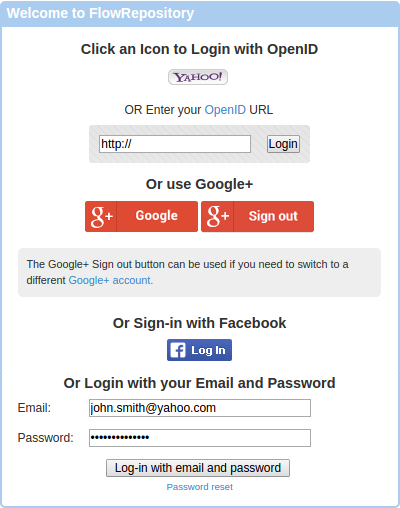 If you are a Google account user and you have registered using Google+, or you have registered with a Google-based Open ID in the past, or you have registered using Facebook with a gmail account, then you can use Google+ to login to FlowRepository. Simply click on the g+ Sing in button to continue. That way, FlowRepository never sees your Google password, but Google will inform FlowRepository that you logged in and who you are. If there are multiple Google+ accounts associated with your browser, then Google will open a pop-up window and let you choose which account to use. Accounts associated with your browser can be managed by clicking on your account icon in the top right corner of https://plus.google.com/. Please note that you need to select the email address that you used when registering to FlowRepository. You may also have to agree to share your email with FlowRepository if this is the first time signing in. If you are already singed-in to Google in your browser, then you will see a red g+ Google button and a g+ Sign out button as shown below. Clicking on the g+ Google button will sign you in FlowRepository with the email address used in your Google+ profile. If there are multiple accounts associated with your browser, then Google will automatically pick the default one, however, we need this to correspond to the email that has been used to register with FlowRepository. If it is not the case, then you can use the g+ Sign out button to "sign out", after which you will be presented with the g+ Sing in button that let's you select which account to use. Note that this Google+ sign out is effective on the current page only and it will not sign you out from Google+ in any other browser tabs or windows. If you are a Facebook user and you have registered using Facebook (or using Google+ with the same email address that is in your facebook profile), then you can use Facebook to login to FlowRepository. Simply click on the Facebook f Log-In button to continue. A pop-up window will open and you will need to login to Facebook and also agree to sharing your basic profile and email address with FlowRepository. This is required and used only in order for FlowRepository to authenticate you. That way, FlowRepository never sees your Facebook password, but Facebook will inform FlowRepository that you logged in and who you are. If you have logged in Facebook already and you have agreed to sharing your information with FlowRepository before, then the pop-up window will be skipped. Independently on how you have originally registered, if you have set a password in your profile, then you can also login using your email address and the selected password. If you didn't select a password as part of your registration, or if you have forgotten your password, or if you simply want to change your password, then you can login using one of the third-party authentication methods listed above, then go to your profile (by clicking on the Welcome link in the top right corner), then click on the Edit link in the action panel (on your left), fill out a new password at the bottom of the profile form, and click on the Update button. If you don't have a password (or you have forgotten your password), and you are unable to log in using any of the third-party authentication methods, then clock on the Password reset link and follow the instructions to reset your password.